I have seen that it is possible to define a task in the VSCode. But I am not sure how to define multiple tasks in the tasks.json file. Just in case it helps someone... . If you don't have/want gulp/grunt/etc... or an extra shell script to proxy out your task commands , "npm run" is there already . What helped me understand this better is the sequence of arguments passed to the command. It may be obvious to some but it is not clear in the documentation. The task name myTask is always last. Since version 0.4 it can be omitted with "suppressTaskName": true. I use the following tasks.json file to run multiple TypeScript build scenarios. I put a tsconfig.json file in each folder, so that allows me to tune each folder's output individually. Just make sure you suppress the task name, because it tries to put it in the command string. This is what the folder structure looks like, where /script is the output root and /source is the input root. Both folders reference type declarations in the /typingd folder and /typings folder. TypeScript is somewhat limited to using relative paths in external references, so it helps simplify things if these folder structures are similar. Oh yea, it makes it easier to launch them selectively if you mark them as non build and override the build key to select a specific task from a list, like so..
Update: You can always just go entirely rogue, if you want. There may be better ways to handle the args, but this works for me under OSX at the moment. Notice the first task uses isBuildCommand so CTRL+SHFT+B launches and the next task is isTestCommand so CTRL+SHFT+T launches. However, in order to get the the first task to accept args the task name and args had to be reversed. As of the February 2017 release, you can use Terminal Runner and compose multiple tasks by setting up dependency tasks. It's a little funky in that it will open up a separate integrated terminal for each task, which you have to watch to see if things work and remember to close (they "stack"), and you don't get a "done" notification, but it gets the job done. The functionality is preliminary but it is promising. Here's is an example to run tsc and jspm for a Cordova app. I know there is a lot of different answers here but my approach was a little bit different again so I thought I would add my 2 pence worth. I am on windows and use an external batch file to run my commands. It’s similar to Jonathan's answer above but I don’t pipe any commands to it which means my “tasks.json” file is different. I might change this approach over time (for example I haven’t got around to playing with gulp just yet) but this method is working perfectly fine for me at the moment. @ECHO Now startzing page up in browser! Then, in VSCode I press “CTRL + SHIFT + B” to run my batch file. I have an Electron app that needs to compile a less stylesheet then build and launch the program. I used @Ocean's solution which worked for me...nothing else worked. Both my tasks.json and build-tasks.bat file are in the .vscode directory in the root of the project. I am sure linux would be basicly the same. The only thing that is anoying me is having to maintain the .csproj files just for debuging. I am looking forward to a way to debug with dnx, though I have not looked for a couple of weeks now. Not the answer you're looking for? Browse other questions tagged visual-studio-code vscode-tasks or ask your own question. How to chain tasks in Visual Studio Code using only tasks.json? VSCode: how does tasks work? Pass Arguments to Gulpfile Task from Tasks.json? how to pass multiple args to vscode task command? How to inherit tasks in VSCode? 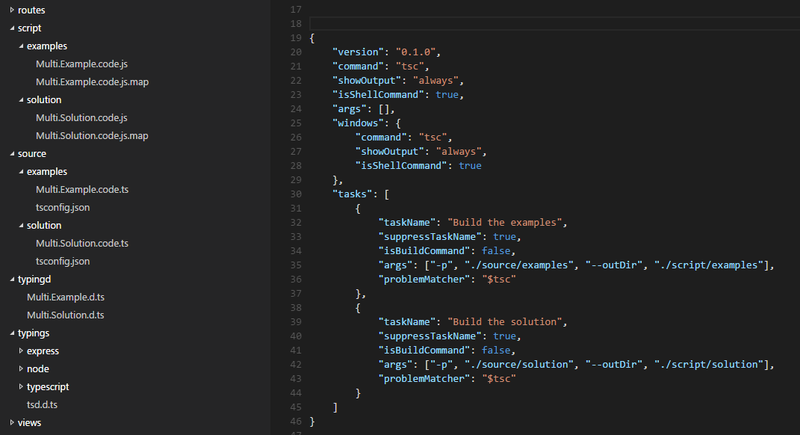 How to define/reference multiple tasks.json files in one vscode workspace?